Why do some MG stories read “young” to me? Why do some Middle Grade novels read “too young” for me? I am asking myself that question because recently I’ve been reading quite a few MG novels that work just fine for me. I’ve spent *years* thinking that basically I don’t like Middle Grade — that the books mostly don’t appeal to me — that the exceptions are rare. Well, I’m having to rethink that, because I somehow keep finding exceptions, and I think they’re adding up enough that I have to stop thinking “this is an exception” and start thinking “so what actual characteristics don’t work for me, that are perhaps somewhat more common in MG fiction than YA or adult? You see how different that is. 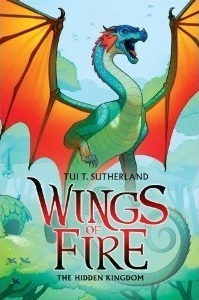 And I’m currently three books into the MG WINGS OF FIRE series by Tui Sutherland, which I like a lot. So you see these are starting to add up. I’m definitely more willing than I used to be to pick up a MG novel on the same basis as YA or adult — eg, one glowing review from someone whose taste I trust to match mine pretty well. MG fiction that doesn’t work for me . . . I don’t actually want to name specific titles. But there truly are quite a few MG stories I’ve tried and not finished, or barely finished, which is obviously why I pegged MG initially as not-really-for-me. A) The worldbuilding is too silly and the writing is not enough to my taste to make me not notice or not care. The worldbuilding can be pretty ridiculous and the book can still work for me. Harry Potter comes to mind. Hardly anything about that world actually makes the least sense. But Rowling is good enough at writing, at the detail level, and at dialogue that the implausibility of the world doesn’t actually bother me. I can think of a handful of MG titles where the worldbuilding did not work for me, so what I think is going on there is that the author’s actual writing did not provide enough distraction from the implausibility. Other forms of stupidity also turn me right off, often permanently, even if seen in a secondary character. In EON / EONA, the utter stupidity of the politically savvy older mentor character accepting a bitter-tasting glass of fruit juice from an unknown source when he has every reason to fear assassination . . . yeah. For me, that duology never actually recovered from that moment. I did finish the duology, but I eventually gave the books away. I can easily think of adult fantasy novels where the same kind of thing made me toss the book on the give-away pile. But in MG more than books aimed at older readers, I think we *often* see an impulsive protagonist — impulsive to the point of real foolishness — and I suspect that this kind of protagonist is more often than not the cause of the too-young-for-me feeling. So. I’m guessing that if Tui Sutherland had *started* her series with the Seawing Tsunami as the pov protagonist, rather than with the Mudwing Clay, I might not have gotten into the series. It might not have been an issue, because the plot pushes back against Tsunami’s impulsiveness right away and Tsunami rapidly outgrows that characteristic. Still, Clay is a much, much more appealing character for me. I imagine predictability could be a problem for older readers who are experienced enough to see the broader shape of the story, but actually predictability isn’t such an issue for me. I’m not reading the WINGS OF FIRE series to see how it comes out. I’m reading it to enjoy watching the characters get there. I can imagine other readers might have more of an issue with obvious plot points, though, and that might be something that pushes some readers away from MG stories. If I met someone whose main complaint about MG was predictability, I’d offer them … what? CUCKOO SONG by Hardinge? Maybe one of Merrie Haskell’s books. 8 Comments → Why do some MG stories read “young” to me? I’m glad you’re enjoying Wings of Fire! And now I’m thinking about what makes a MG fantasy not work for me. I have one sitting unreviewed right next to me that I have no enthusiasm for–the plot was fine, the worldbuilding and tension was fine, but the author never made me care about the characters because the plot was more important and so the characters weren’t given enough time to change. The plot demanded certain responses and actions so the characters had no choice. Motivations have to make sense. Also if things are too silly in a book that isn’t straightforwardly Silly I am not much interested. But a truly good MG fantasy is arguably as good a read as anything else. And some books really are too young for grownups, and that is fine too. I absolutely agree that a great MG is as absorbing as any other great story — and that a MG story can be perfect for younger readers and doesn’t have to appeal to adults. Very important point! Maureen got at that too by asking who votes on YA awards, and I do think that may be an unsolvable problem — voters will surely always skew much older than readers, which will always be unfair to books which do a great job appealing to 15 year olds but not adults. So if you’re reading some that read young, they may well be aimed at a younger audience than the older-MG books you prefer! Stepanie, I’m sure you’re right. I used to think I was most interested in Older-YA up; now it’s clear to me it’s really Older-MG up. I hardly think it would be reasonable to cut the categories up even finer, but yeah, huge variation all through those years. Have you read The True Meaning of Smekday (by Adam Rex)? That’s one of my favorite MG books. They made a movie sort of based on it but the book is much better, and touches on some tricky themes while staying really entertaining.